Valentine's Day: Local Ways to say "Je t'aime"
The 14th of February has a special significance for me. This is because the date represents the fact that we're halfway through February. Getting mid-way through this month is a great relief to me as I am not a Winter person by any means. By the time I get this far into the cold season, I'm usually counting down the days to the end of the longest short month of the year. I'm not just a weathered Seasonal Affective Disorder vicitm (pun intended), though- I also suffer from an acute case of Spring Fever. The promise of the arrival of Spring is enough to make me swoon, and any signifier of the progression of time that brings me closer to the solstice with the mostest is more than welcome, so that's usually what I celebrate when Valentine's Day rolls around. However, I must admit that the fact that sometime around the 14th (give or take two days) my dude usually brings a flower home for me isn't so bad, either. I don't mind ringing in the daffodil season with a hearty rose or two. Still, the Hallmark holiday aspect and the vulgar marketing of the event (I saw a vaccum being sold at a "low Valentine's Day price" in an advertisement in the metro the other day) can make Valentine's Day a very boycott-worthy event. I get it. But, for those of you who are suckers for the tradition (the newly-coupled, those who cry at the end of Pretty Woman, and the fleur-o-philes among us) I offer a few Valentine's Day themed artisinal and local products that you can have fun finding and sharing with your chèri(e) on the 14th. If you have the habit of planning ahead for this special date, I suggest penciling in a visit to the weekend's organic markets or placing an order for some of the local and creative gifts that are available within 100 km of our lovely City of Light. Ekeing in at just under the 100 km mark at 95 km from Paris, Provins is certifably local and certainly lovely. The region's pride and joy is the Rose de Provins, which was brought back from the crusades by Thibaud IV of Champagne in 1240 and has become emblematic of the surrounding area. This sustainable souvenir is the main ingredient of the region's several local specialties. 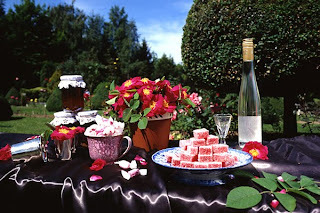 Oils from the rose are prepared as “confits” and syrups, as well as liquors and bon bons. Honey from bees in the region and rose petal tea are also also a by-products of the famed fleur. 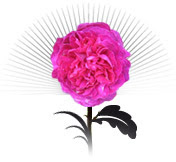 If you want to give some one a rose that keeps on giving, check out the city's online boutique where you can find the above-mentioned products and more information about Provins and its artisans. If you prefer to stay within the confines of the metro lines, I recommend hitting up either one of Paris' 100% organic markets - Batignolles or Raspail- and picking up some artisinal-as-it-gets chocolate. My friend Terresa recommended I check out this chocolate made by a woman who retired from her day job (making chocolate) and then came back to the chocolate trade, to the delight of any organic market-goer who has tried her milk, dark, and white chocolate varieties (either plain or with hazelnuts and almonds, 45.20 euro/kilo). At the Marché Raspail or Batignolles, look for the stand that sells dried fruits and grains, it will also be equipped with boxes of bars of chocolate and the lovely women who (wo)man the stand will be happy to hook you up. The chocolates are sold in bulk and then sent home with the buyer in a little plastic bag. It's no heart-shaped box, but as Terresa points out, "The beauty is in la bouche". While at the market you can also pick up some fresh flowers or some organic honey for your honey. If you can't make it out to Batignolles or Raspail on the weekend, or if fresh flowers aren't your thing, head over to the 9th arrondisement and visit Aurore Capucine (3 rue Rochechouart, 75009 Paris m° Cadet, ). This little salon de thé/bakery offers a bouquet of floral delights, including lavender and rose flavored cookies and cakes (1.20-3.70 euro) and their speciality, the macaron. I tried the fleur d'oranger macaron and thought it was quite good, but found it no more special than their sablés; which are perfect for dunking in thé. Complemented with ginger, honey, and apricots, Aurore Cupucine's variety of confections make a perfect treat for sweetheart. For the more traditional, chocolate versions of most baked goods are also available. Wherever Valentine's Day takes you, and whomever it brings you together with, I hope you'll find yourself with good company and something sweet to eat, it's the least we can do to get through these dwindling days of Winter.